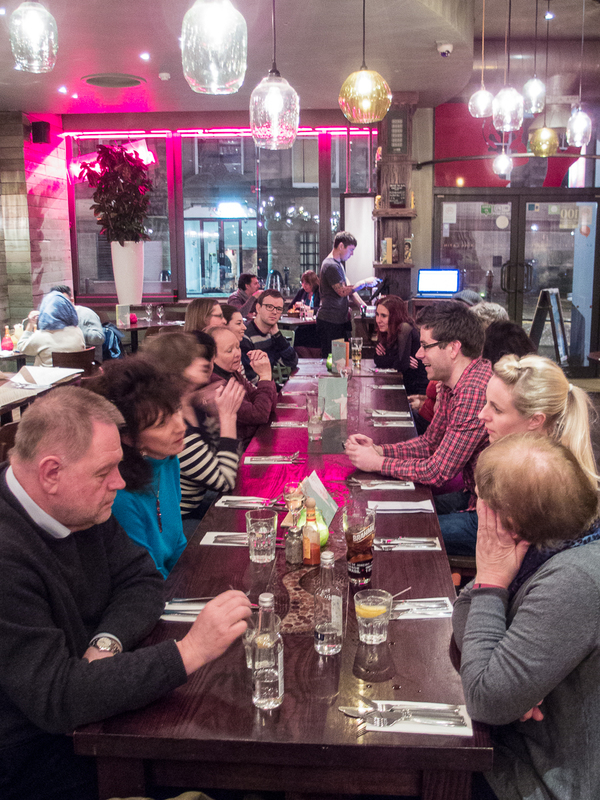 On Wednesday 9 March, Yorkshire Translators and Interpreters (YTI) had its March social event at Las Iguanas in Leeds. Seventeen of us descended on the Latin American restaurant in the city centre on what was a very cold evening. After gathering in the bar area for drinks, we were taken to a long table large enough to accommodate all of us. Having placed our orders, a variety of dishes began to emerge, from nachos, to burritos, to fajitas and enchiladas. A number of the group also took advantage of the special offer on cocktails. With 21 different varieties, we were spoilt for choice! Plenty to talk about while waiting for our food. One of the things I really appreciate about YTI is that our members come from such a wide range of backgrounds in terms of nationality, languages, specialisms, and professional and life experience. As a result, there were probably almost as many topics of conversation as there were items on the menu! Certainly, in the rare moments when I wasn’t chin-wagging myself, I noticed that pretty much everyone was happily chatting away. The cold weather was now far from our minds and it was time for dessert. Churros were a popular option with those around me, but I was already full, so had to pass on the sweet treat in favour of a coffee. All in all, it was a thoroughly enjoyable and worthwhile evening, and I’d like to thank Charlotte and Paul for organising it.